Rudi Fronk and Jim Anthony, founders of Seabridge Gold, discuss why the stock market's been up and why it likely won't last. During the last week, the major market indices rallied again. There was no news to account for it. But there was a reason. The U.S. Treasury has been up against its debt ceiling since March 15 when the ceiling was re-imposed. Since then, there has been no net new issuance from the Treasury. The Treasury has run down its cash balances and borrowed internally from its own resources, which are not subject to the ceiling. This period has been very helpful to the financial markets. With the federal government not selling any net new supply of securities—just rolling the maturing stuff over—the markets have been flush with cash that would otherwise have been absorbed by the government. This hit of extra liquidity is about to disappear and then some. President Trump has made a three-month debt ceiling deal with the Democrats which means that the Treasury can resume borrowing without restrictions through December. This increase in the debt ceiling is needed to reliquify the federal government (which is down to $38 billion in cash) and repay the internal funds the Treasury raided since the debt ceiling was imposed back in March. The Treasury needs to borrow a substantial amount of money. There hasn't been a material increase in the Treasury's borrowing schedule yet, but it is coming. The Treasury Borrowing Advisory Committee (TBAC), a group of senior Wall Street executives, has advised the Treasury to issue $501 billion in net new supply in the fourth quarter, virtually all in November and December, and the Treasury almost always follows the TBAC script. That's an outrageous amount of money. The cash the Treasury needs is not sitting somewhere in primary dealer bank accounts; it's invested in the financial markets. Securities will have to be sold to accommodate this new issuance. This is not new. 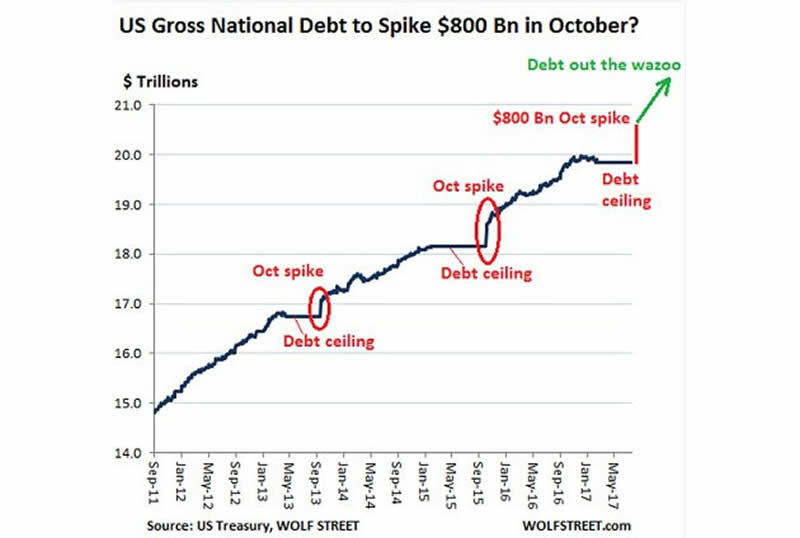 A borrowing spike happens every time we have an increase in the debt ceiling as the chart below demonstrates. Note that this chart reflects an estimate of net new issuance needed to return to last year's cash on hand and was produced before TBAC had issued its recommendations. TBAC is proposing to move more slowly. Nonetheless, past funding spikes are clearly demarcated and the next one is going to be big. While Treasury supply will increase, the trend of demand for Treasuries has been going the other way. Bid coverage at auctions has been declining in recent months and the largest banks have been reducing their inventories of Treasury securities. Falling demand in the face of increasing supply is a recipe for a bear market in bonds. Bond yields will rise and that will put pressure on stocks as well. The Federal Reserve has given the market extraordinary support over the past eight years by financing most new Treasury supply. Even after it stopped outright Quantitative Easing in November of 2014, the Fed continued to buy $25–$45 billion per month in maturing Mortgage Backed Securities from the primary dealers. That cashed up the dealers and helped finance their purchases of new Treasuries. But now, the Fed intends to join the Treasury as a net seller of Treasuries (and MBS) as it starts to reduce its balance sheet this fall. Once the Fed stops buying that paper, the dealers will have a lot less cash and that means a lot more selling. Gold is traditionally a hedge against financial market risks. We may soon have the opportunity to test that hypothesis yet again. The key is to follow the money. This article is the collaboration of Rudi Fronk and Jim Anthony, cofounders of Seabridge Gold, and reflects the thinking that has helped make them successful gold investors. Rudi is the current Chairman and CEO of Seabridge and Jim is one of its largest shareholders. The authors are not registered or accredited as investment advisors. Information contained herein has been obtained from sources believed reliable but is not necessarily complete and accuracy is not guaranteed. Any securities mentioned on this site are not to be construed as investment or trading recommendations specifically for you. You must consult your own advisor for investment or trading advice. This article is for informational purposes only. 1) Statements and opinions expressed are the opinions of Rudi Fronk and Jim Anthony and not of Streetwise Reports or its officers. The authors are wholly responsible for the validity of the statements. Streetwise Reports was not involved in any aspect of the content preparation. The authors were not paid by Streetwise Reports LLC for this article. Streetwise Reports was not paid by the authors to publish or syndicate this article. 2) Seabridge Gold is a billboard sponsor of Streetwise Reports. Streetwise Reports does not accept stock in exchange for its services. Click here for important disclosures about sponsor fees. The information provided above is for informational purposes only and is not a recommendation to buy or sell any security. Chart provided by the authors.